What was the first jazz record? Are jazz solos really improvised? How did jazz lay the groundwork for rock and country music? 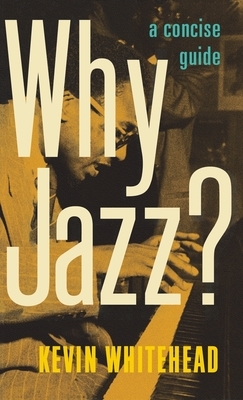 In Why Jazz?, author and NPR jazz critic Kevin Whitehead provides lively, insightful answers to these and many other fascinating questions, offering an entertaining guide for both novice listeners and long-time fans. Organized chronologically in a convenient question and answer format, this terrific resource makes jazz accessible to a broad audience, and especially to readers who've found the music bewildering or best left to the experts. Yet Why Jazz? is much more than an informative Q&A; it concisely traces the century-old history of this American and global art form, from its beginnings in New Orleans up through the current postmodern period. Whitehead provides brief profiles of the archetypal figures of jazz--from Louis Armstrong and Duke Ellington to Wynton Marsalis and John Zorn--and illuminates their contributions as musicians, performers, and composers. Also highlighted are the building blocks of the jazz sound--call and response, rhythmic contrasts, personalized performance techniques and improvisation--and discussion of how visionary musicians have reinterpreted these elements to continually redefine jazz, ushering in the swing era, bebop, cool jazz, hard bop, and the avant-garde. Along the way, Why Jazz? provides helpful plain-English descriptions of musical terminology and techniques, from "blue notes" to "conducted improvising." And unlike other histories which haphazardly cover the stylistic branches of jazz that emerged after the 1960s, Why Jazz? groups latter-day musical trends by decade, the better to place them in historical context. Whether read in self-contained sections or as a continuous narrative, this compact reference presents a trove of essential information that belongs on the shelf of anyone who's ever been interested in jazz. Kevin Whitehead is the longtime jazz critic for National Public Radio's "Fresh Air" and has written about jazz for many publications, including the Chicago Sun-Times, Down Beat, and the Village Voice. He is the author of New Dutch Swing (1998), and his essays have appeared in such collections as Da Capo Best Music Writing 2006, Jazz: The First Century, and The Cartoon Music Book.